“Saintly Rhymes for Modern Times” by Meghan Bausch. Our Sunday Visitor. (Huntington, Indiana, 2018). 28 pp., $16.95. Resist the temptation to wince at the possibility of yet another children’s book on saints. This one is different and will be a special keepsake for little ones. “Saintly Rhymes for Modern Times” is a compilation of poems featuring 18 holy men and women. The poems are short, sweet and meaningful: They include all the information a child needs to know about that particular saint in a few short few rhyming lines. The saints are paired with beautifully unique illustrations made with overlaying photographs. Ages 2 and up. “Secrets: Visible and Invisible” by Carolyn Astfalk, T.M. Gaouette, Theresa Linden, Susan Peek, Cynthia T. Toney, Corinna Turner and Leslea Wahl. Catholic Teen Books (Hummelstown, Pennsylvania, 2018). 214 pp., $13.99. This anthology of short stories for Catholic teenagers, being released July 4, is a true literary treasure. It provides genres for every type of reader, each so well written that the reader is invited to fully escape into many different worlds and places. The short stories will take its readers to dystopian Europe, high school hallways, a city block in summer and a soldier’s medical ward in 16th-century Italy, just to name a few. The characters are diverse, exciting, relatable; their adventures are accessible, mysterious and enthralling. But within these different settings, there is one uniting comfort: God is always there, whether revealed in a desperate prayer to a guardian angel, through pure romantic love, the presence of Christian charity, men and women religious, or within the sacraments. The hope that comes through Catholicism and Jesus prevails in each vignette, and yet there is still heavy doses of drama, suspense and tactful violence. So if your teens seem totally spaced out and properly engrossed, take courage knowing their love of reading and their love of the faith is being fed through these beautiful stories. Ages 12-17. “The Miracle of the Bread, the Fish and the Boy” by Anthony DeStefano, illustrated by Richard Cowdrey. Harvest House Publishers (Eugene, Oregon, 2018). 31 pp., $14.99. “The Miracle of the Bread, the Fish and the Boy” retells the famous story from the Gospel of John in which Jesus miraculously multiplied enough bread and fish to feed a crowd of thousands. It is told from the viewpoint of that little boy, spotted by Andrew in the crowd, who had just five small loaves and two small fish to share. In this adaptation, we learn that the little boy had intended to use that food as a gift to his mother, who desperately needed a break from hardship. And yet his generous gift of sacrificing for and trusting Jesus not only became a miracle for the thousands, it also created a special miracle just for his family. The illustrations are bright enough to grab the attention of younger listeners while the text is appropriate for a broader age range of readers. Enjoy reading the story aloud first without revealing its title, and see how your children discover the familiar miracle unfolding as told through their perspective. Ages 4-8. “The Pope’s Cat” by Jon M. Sweeney, illustrated by Roy DeLeon. Paraclete Press (Brewster, Massachusetts, 2018). 62 pp., $9.99. Young lovers of Pope Francis and cats beware: You’ll be hooked by this new series that displays the tenderness of an already beloved pope. True to his form of loving all of God’s creation, Pope Francis adopts a stray cat who needs a little tender loving care (and a bath) before becoming more comfortable in the papal quarters. This first novel in a series (to be followed by “Margaret’s Night in St. Peter’s”) introduces us to Margaret, a sweet stray cat in need of a warm home and food. We learn just a little bit about her and a little bit about the pope’s daily life, making readers eager for more. Ages 4-8. “God Knows It’s My Birthday” by Angela M. Burrin, illustrated by Andrew Everitt-Stewart. Word Among Us Press (Frederick, Maryland, 2017). 29 pp., $14.95. This sweet book will give your child (or godchild) all they need to know at a young age: He or she is special because he or she was created by a loving and all-knowing God, Jesus is our gift from God, and Mary is Jesus’ mother. Within these pages, author Angela M. Burrin speaks directly to children letting them know these simple, yet profound truths that will set them up for a foundation of faith. The book is a journal, and children are encouraged to draw pictures and write about special memories and milestones. Parents can guide younger children, making it appropriate for a broader range of ages. Ages 4-9. “Hidden City: Poems of Urban Wildlife” by Sarah Grace Tuttle, illustrated by Amy Schimler-Safford. Eerdmans Books for Young Readers (Grand Rapids, Michigan, 2018). 48 pp., $17. Each year one collection of poetry stands out among the others, and “Hidden City” wins the prize. The beautifully illustrated poems will appeal to the city-dwelling or city-exploring child who may not notice or appreciate God’s beauty in nature amid the concrete wilderness that is urban life. Creeping through the bricks, crouching in the bushes and hunting in the night are wildlife: moss and birds, feral cats and raccoons. The collage illustrations add to the feelings of a busy city alive with life; the poems rhythmically coincide with the changing seasons. Ages 4-8. “Marian Consecration for Children: Bringing Mary to Life in Young Hearts and Minds” by Carrie Gress. Tan Books (Charlotte, North Carolina, 2018). 170 pp., $14.95. 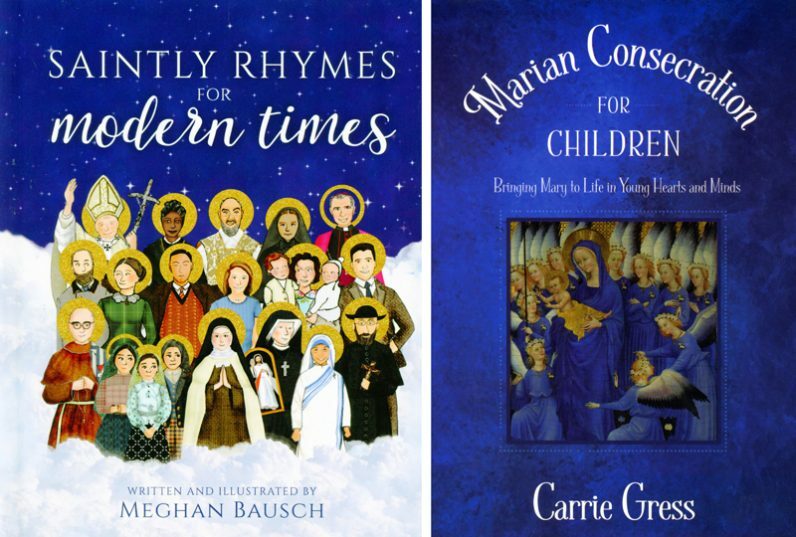 Following the universal church’s first celebration of the feast of Mary, Mother of the Church, a book just for children on Marian consecration seems quite timely and fills a needed void on bookshelves. As the author describes, “Marian consecration is making a gift of ourselves to the Queen of Heaven so that she may better be able to direct us, mother us, and love us in a way most pleasing to God.” It contains 33 days of preparation with a short reflection, discussion points, trivia and prayers. Similar to adult Marian consecrations, the days lead up to a Marian feast day that will become special to your children as they prepare and potentially throughout their lifetime. Simple, practical and fun, the book is full of meaningful anecdotes, special prayers, facts about saints and interesting revelations about the church. “Molly McBride and the Party Invitation: A Story About the Virtue of Charity” by Jean Schoonover-Egolf. Gracewatch Media (Winona, Minnesota, 2018). 31 pp., $11. Molly McBride and her friends easily teach your school-aged children (and without them even knowing!) about how to be charitable to others in their daily lives. One in a series, “Molly McBride and the Party Invitation” is the story of young Molly facing a familiar conflict: Who should she invite to her party? She wants to leave out the mean kid, but needs some prodding to understand that Christian charity demands more from us. The best part about this book and the Molly McBride series is that it naturally integrates normal interactions between children, laity and men and women religious. Molly herself is a big fan of nuns and wants to be one when she grows up. Her best bud Dominic wants to be a priest one day, too. And how could they not? The men and women religious depicted in this series are welcoming, wise and gentle. Ages 5-9. Lordan has master’s degrees in education and political science and is a former assistant international editor of Catholic News Service. She is a digital editor at Peanut Butter & Grace, an online resource for Catholic parents.